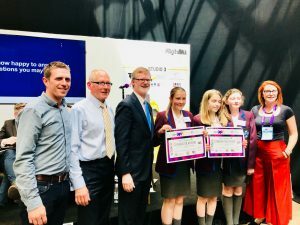 The winners of Digital DNA’s Digital Futures competition – designed to inspire school children to get involved in the world of tech – are about to jet off to Silicon Valley. The three year 10 pupils from Dalriada School in Ballymoney will have the chance to meet leaders from the world’s top technology brands including Google, Microsoft, Instagram, LinkedIn and Salesforce. They will also sit down with Sarah Friar, CFO of mobile payments firm Square. Sarah who originates from Sion Mills, Co. Tyrone is now one of Silicon Valley’s top women in Fintech and passionate about inspiring future leaders in tech. Listed on the NYSE, Square was established by the co-founder of Twitter, Jack Dorsey. Lana McArthur, Chloë Bond and Jessica Pinder, year 10 pupils from Dalriada School were crowned this year’s winners of the Digital Futures competition, when they pitched their idea for an app that would help sufferers and their families manage the daily challenges that living with dementia brings. 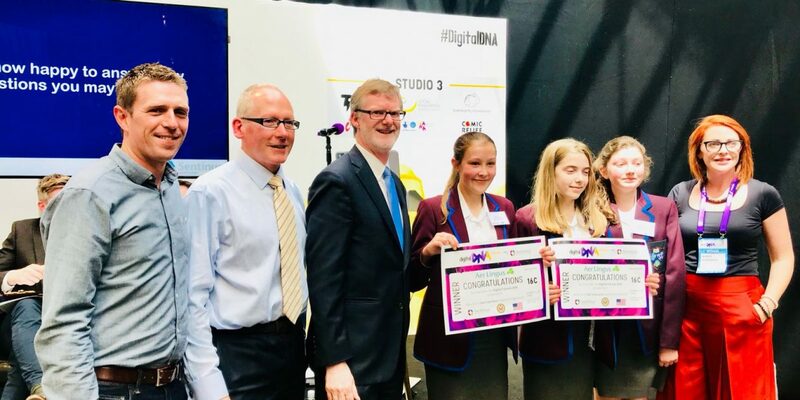 The annual competition culminated at Digital DNA’s annual technology and business event in St. George’s Market in June 2018. Now in its sixth year, Digital DNA’s Digital Futures programme is held in partnership with Sentinus, a charity promoting STEM subjects (science, technology, engineering and maths). The programme is aimed at inspiring the next generation on the possibilities that digital technology provides. During the 8-week programme, over 1,000 young people were introduced to the fundamentals of digital technology, received a crash-course in coding and a brainstorming session to solve or embrace a real-world business problem or opportunity. (L-R) Gareth Quinn, Founder Digital DNA, Bill Connor, CEO Sentinus, Dan Lawton, U.S. Consulate General Belfast (former), Lana McArthur, Chloë Bond and Jessica Pinder, Digital DNA Futures Winners & Naomh McIlhatten, Founder SmartGlobal & Digital DNA Futures Judge.